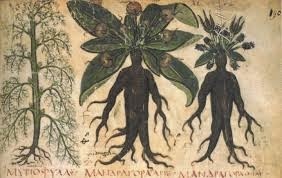 There are several generally interesting and loosely held theories among herbalists. One is the Doctrine of Signatures, in which plants resemble in some way the part of the body or organ for which they will be most helpful. A quick example would be a walnut which, when cracked open resembles the brain and contains brain nourishing oil and nutrients. Another theory has to do with the plants that show up of their own volition, seemingly seeking you out. I attempted to find a name for this theory, but when one Googles, "when herbs show up on their own," it is all about drug testing, so that was no help at all. I first heard about this during a conference over 20 years ago and truly wish I could remember the herbalist who gave the talk. She had a serious disease and when poke weed grew ever closer to her door, she decided to try using it - with great success. Over the years I've been involved in many discussions about how this works, if it works, etc. Basically, we know plants have intelligence, but what other things influence the travel of herb plants? Animals, birds, and weather are just a few. I currently have poke weed trying to get IN my door, but at the same time raspberries, jewelweed, and poison ivy are fighting over the cellar window, so it's confusing. In any case, there are hundreds of plants growing within 500 feet of my door. Many I have invited or kidnapped, while even more wander in on their own. Having been a field two decades ago, the native population isn't going anywhere either. But here's the thing I notice; we are being inundated with relaxing, mood-elevating, nervine herbs. Some were planted, some are wild, and most importantly they are all thriving. The chamomile is a little of both, since a few plants were rescued from a construction site and have stretched and spread. The mimosa that sprouted in the middle of the back yard was a complete surprise. The holy basil has resown itself, and the CA poppy was my own doing. St Johns wort came up in two different places. The passionflower started as a tiny sprig that I was sure had been too long ignored in the pot, and now it threatens to bully out several other cherished plants. Motherwort lines one of the paths to my sister's house. My generous neighbor has gone organic with oats and red clover. I've never been able to grow borage since the bunnies seem to adore it. This year Stephany Hoffelt talked about how the flower tincture is her go-to for alleviating sadness, and whammo! My borage has sprawled all over the place as I gather the flowers daily. This concerns me a little bit. I'm really a pretty happy-go-lucky person. Things have to be really bad or stressful to get to me. In fact, as I dutifully dry or tincture these wonderful gifts, it is with a fair degree of certainty (and optimism) that I will not be using them, but instead they will go to others. I know that because it is nearly impossible for me to stay awake past 11 pm, life is good, and I much prefer days that include a cat nap. You can't just ignore good medicine, though. Even if it is in smallish quantities, it must be harvested - just in case. These kind of things would have been far more helpful when life was more like a roller-coaster. Oh... I get it! Maybe they are here for the younger folks living here! Yes. Let's go with that. Monarda – It’s About Time! Monarda seems to be getting more attention this year. As a 2013 Notable Native Plant, the Herb Society of America has brought it front and center as valuable North American Native. For those of us who have respected and used it for years, it’s about time. Not only is this a lovely plant, but a versatile one as well. Which is the lavender one; which is the red one are common questions? The red one, didyma and the lavender one, fistulosa are the most common among the seventeen species, fifty cultivars and countless wild hybrids referred to as Monarda. The colors change slightly from region to region as well. Our fistulosas are definitely lavender. Others seem more pinkish. 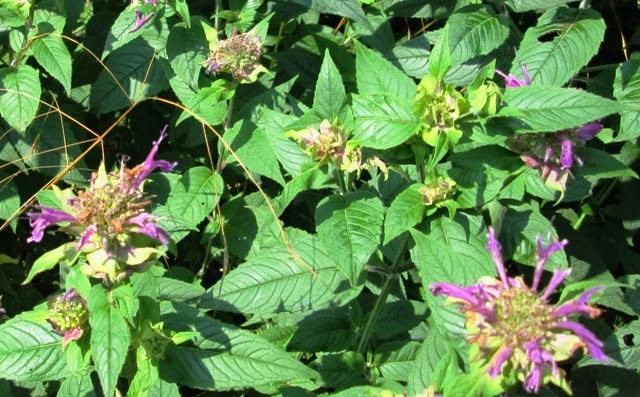 You may recognize it by its more common names: Bergamot, Bee Balm¸ Wild Bergamot, Oswego Tea or Wild Oregano. This North American native is a member of the mint family, so beware, they are known to be non-invasively challenged if conditions are perfect. Those “perfect” conditions, however, are quite common – they prefer sun but semi-shade is ok too. They like nutrient rich well drained soil everyone talks about, but few of us outside of botanical gardens actually have. I can attest to Monarda thriving in compacted clay soil, just by looking outside. The origin of the name Monarda is interesting. A physician/botanist from Seville Spain, Dr. Nicolas Monardes (1493-1588), who incidentally never set foot in North America, named it after himself. He authored one of the first books on the flora from the “new world”, but only after they were brought across the ocean for him to study in Spain. It is said he thought the crushed leaves smelled much like the citrus fruit Bergamot (as in Earl Grey tea), and thus its most common name. Monarda fistulosa is native to the Oswego New York area (western NY/Lake Ontario region) but can be found across most of North America (except, I'm told in California, Florida and Alaska). Native M. didyma is more an eastern/central North American plant. If you’re a zone person – think Zones 3 to 9. Being a mint, it has a square stem and opposite leaves. It can grow as tall as five feet, but most are around two to three feet. The flowers are in bloom from June to September. Propagation is best by root division in the early spring. Most people who have them are happy to part with a few clumps! Stem cuttings are also possible when the stems are about four to five inches tall. My first clump came from the ditch down the road. I was caught without my usual “truck trowel”, and dug with my fingers and opps, it came out with only a couple small roots. That single plant with barely any roots spread to at least 1,000 plants over the years…..so they are easy starters. Only the true species will grow from seed. Germination is easy and takes from ten to forty days. When the flowers turn brown, collect them for seed. Seeds should be stratified before planting. Stratification means mimicking the conditions the seed would encounter in nature. In my case, this means a cold moist winter. I usually collect them and store them in the refrigerator over winter – tagged with “MONARDA SEEDS - DO NOT EAT”. You can test seed viability (of any seed) by placing 10 seeds in a wet paper towel and placing in a plastic baggie (not zipped closed but keeping it moist). Check it every couple of days. If 5 seeds sprout, your viability is 50%, eight means 80%, etc. (Do this after you’ve stratified them.) 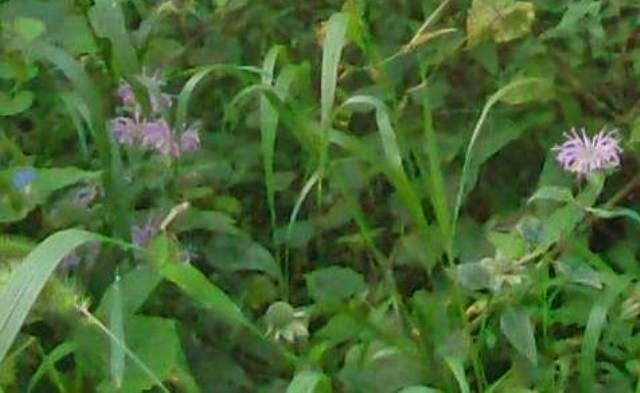 If none of your Monarda seeds sprout, you may have a sterile hybrid, or bad seed. Doing this can save a lot of disappointment later. To keep your Monardas healthy, clumps should be divided every three to five years. Left in the wild, they move around by themselves. Monardas attract bees, hummingbirds and butterflies. Due to the tubular structure of the flower, bees sometimes have difficulty, but nature provides, and insects leave tiny holes for this purpose. The native species are prone to powdery mildew. Harvesting the leaves just before the flowers open is optimal, and younger leaves are more desirable. Older leaves seem to taste more bitter, but drying seems to help with this. The flowers should be harvested in full bloom and before the mildew sets in. Personally I think the red ones taste better and I use them as both a tea and sprinkle the petals in summer salads. In my experiences, the lavender ones seem to be more medicinally beneficial (but also good in tea and salads). A Monarda claim to fame was its use as a tea substitute after the Boston Tea Party tea toss! In the language of flowers, it symbolizes compassion and sympathy. Culinary uses: Leaves in lemonade, jams, jellies, meat flavorings. I love to infuse the leaves and flowers in apple cider or champagne vinegar and use as a marinade for venison. Historical medicinal uses: Since there are several Monardas throughout North America, tribes incorporated it into daily living in different ways. Some of their uses included: colds, flu, upper respiratory, gas, diarrhea, nausea, fevers, and whooping cough. Plains tribes poulticed boiled leaves for fungal infections. Colds and chills were helped with a warm cup of tea; infusions were used for sore throats and externally as wound washes. The mashed plant was placed on the forehead for headaches. The leaves and flowers were rubbed on the body as an insect repellent; and externally the boiled leaves were used for muscle spasms. It can be infused in honey for sore throats. A steam was used to clear sinus. It is delicious in oxymels and elixirs. I work for the Oneida Tribe of Wisconsin. In our natural food store, Tsyunhehkw (meaning Life Sustenance, and pronounced “chan heck wa”) Monarda is a staple and has been referred to as #6 for as long as I can remember. It is harvested in July, dried and put in the store for use as a tea for upper respiratory problems. This is one plant you should harvest yourself; very few places offer it for sale. Other uses: Dried flowers retain their color and can be used in dried arrangements, craft projects, and in potpourri. Herbal energetics of the plant are stimulating, spicy and diffusive. Active Constituents: Thymol – a strong antiseptic found in Thyme and often used in mouthwashes – although much of it is a synthetic now. M. punctata (Horsemint – more common in Eastern United States) is said to have more thymol than thyme. Research: I located very little current research. One source offered that it may inhibit herpes simplex. Another stated there were 30,000 parts per million of the anti-oxidant that may prevent tooth decay, geraniol – even more than in green tea. Use for Animals: I’ve used infusions for skin problems on my horses. It also seems to be a fair flea repellent on dogs. And neither the dogs nor the horses seemed to mind me using it on them. I hope you have wild Monarda living around you. Remember only harvest what you know for certain has not been contaminated with chemicals, and leave enough to enable it to sustain itself and you for the years ahead. Since it’s a mint, you’ll want to dry it as quickly as possible and store in air tight glass containers. A quick, easy and inexpensive way to dry herbs is to put them loosely in brown paper bags, mark the bag, put it in the backseat of your car and park in the sun. It dries usually in one hot day and your car will smell great! Have fun with your Monarda this summer! I took a handful of days off recently. Completely. By that, I mean no computer, no smart phone. Not even a camera. It included about 8 hours of travel by train. The vacation itself was delicious, but the aspect that I want to talk about is that disconnection. It was the first time in 4 or 5 years that I've been "out of touch" and it was wonderful. It seems that all that connection to everyone stunts my thought process. Do you ever say to yourself, "oh! that's a great update!" or "I've been scrolling for hours?" Or when something happens, find yourself wondering what others are saying about it before fully coming to your own opinion? I do. During the course of a couple large writing projects over the winter, it became apparent that the internet is an escape. It stops thought and zones one out. It is necessary for business, but at the same time, there needs to be a limit. As one of the few people left in the world (it seems) without a phone that acts as a computer, people expect instant answers, and I'm not certain, but it also seems that writing an email late at night is akin to calling someone in the middle of the night these days, since they are all set to notify the recipient. Sitting on the train, I was glued to the large window beside me. People who live near train tracks usually stop noticing the trains at some point, or at least stop noting that they are filled with people. Most of my fellow travelers were engaged in conversation, or had pulled out electronic devices, so not everyone looks out the window, but there's a lot out there. As someone who spontaneously makes up a story about every vignette I see, it was a busy, busy ride. Why was that one man on a loading dock the only person visible along a block long factory? Were all those kids in the backyard pool having a birthday party? Why are all the work horses in the meadow today? Is it too hot for them to work? In the cities, people toss bags of trash right over the edge of their yards onto the tracks. Is it ever picked up? Do they get fined? In the poor sections of town, how many people in the country don't know that kind of poverty exists? Would they care? That little boy riding his bike along the other track... do his parents know he does that? On and on we ride. I notice that the coarse gravel that lines the tracks and the embankments is filled with the glitter of broken glass. It is that way in the cities and in the countryside, so I think maybe it comes from landfills. We stop in a town called Lindenwold. I look everywhere, but there are no linden trees. Eventually I start noting the plants as they fly by. Close to the tracks they are probably sprayed, but I can see further back. Close to the ocean, it is swamp grasses with shore birds of all kinds. There are many bayberry shrubs, and I imagine that the birds eat the berries in winter. Various sumacs and junipers become prevalent as we move inland, and over the last few days the pink mimosa blossoms have opened. Salsify seedheads are everywhere, and when we stop at a small station, to my delight, a single parachute-like seed plays on the wind currents outside my window. Bittersweet climbs everywhere and paulonia trees with their giant leaves line the banks. Japanese knotweed is beginning to bloom in profusion. Yellow mullein flower spikes are abundant, along with yarrow, juniper, daylily, bamboo, pine, toad flax and sweet fern. In another week, drifts of jewelweed will be in bloom. I wonder if it will be yellow or orange. And then there is the milkweed. Glorious, ready-to-bloom milkweed is everywhere! I see it close to the tracks, and way off in the distance. The deep pink flower buds are just about to pop, giving nourishment and a ready nursery to the monarch migration. And there are wild roses. Elderblossoms dot the landscape, growing low and wide in great numbers. At some point, I got bored. Writing was difficult with the swaying and rocking of the train. In my mind, I rewrote the lyrics to "City of New Orleans" popularized by Arlo Guthrie. "Riding on the City of Atlantic, changing cars in Phil-a-del-phi-ay... Halfway home, we'll be there by evening...We'll be gone 300 miles til the day is done." It wasn't great, but it amused me. I got stuck at, "pass the paper bag that holds the ... soft pretzel?" And I liked getting bored. It made me think. Then I got home and checked emails, saving them until I feel like I'm back. I ran outside with a berry basket and picked a pint of blueberries just before lightning cracked nearby. The router went out for a while on the computer. The clocks stopped. I must remember to disconnect more often.